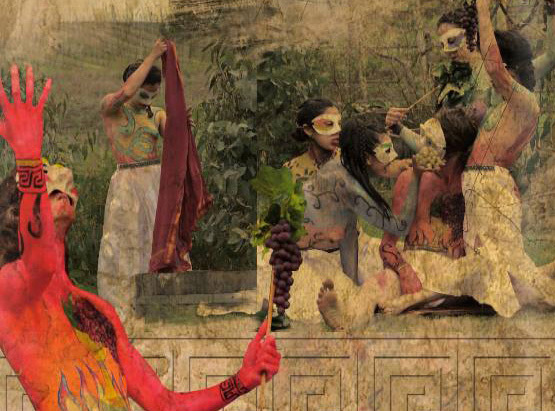 As the director of this new adaptation of Euripides’ THE BACCHAE, my vision has been contextualising the Greek classic within Chilean wine culture. An international cast brings together multidisciplinary techniques, including mask theater, contemporary dance, live jazz, and body art, to tell the story of Dionysus, the Greek god of wine and theater, also known as Bacchus. Our main focus is the representation of the Dionysian rites practiced by the god’s orgiastic cult of female followers, known as The Bacchantes, who possessed the secret to happiness, found in the cathartic joys of wine and art. As part of our performance, visual artists create live body art with the cast of actors and dancers, while the audience enjoys a Chilean wine tasting and watches the characters come to life. This play was first produced at Casa Marín vineyard as part of the first celebration of Chile’s National Wine Day, in September of 2015, in an open-air amphitheater with the vineyard landscape as the scenic backdrop.